I had a lot of fun in 2017 discovering and exposing crypto scam apps that were incessantly flooding the financial sector in a bid to defraud people of their money. One will think that with the level of effort many crypto experts put in exposing the scams, this 2018 will see less of the fraudsters’ antics. 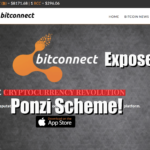 It is indeed very disappointing that the con artists have started again with their unrepentant act by releasing another stupid and apparent scam in the name of Bit Bubble Tech. Ah! 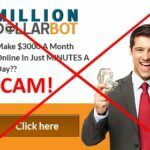 Now, they are calling it a semi-automated trading software that will make money for you while you sit and enjoy. 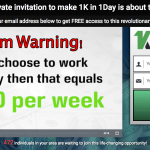 They also promise that it is free and you can make from $400 – 700 dollars in few hours of every day. There is nothing free about Bit Bubble Tech scam app because you can not use it till you invest $250. I think the scammers have back-pedaled a bit from their antics of mentioning their apps ability to make traders thousands of dollars daily to hundreds of dollars. 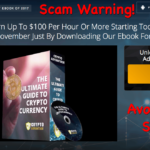 Bit Bubble Tech Review – Avoid This Scam! Well, does that make the dirty Software legit? Is there any truth to this Bit Bubble system or is it just another trick that will waste your time, emotional investment and money? Don’t just spend any of your resources because, after investigation, I discovered that this crypto trading app is another rubbish. There is no viable information about the system or the developers to show that it is real and not trash. Right now negative complaints are already flooding my desk from people who got duped. If you don’t want to join the statistics, keep reading this Bit Bubble Tech review to discover the secrets of the latest crypto trading scam of 2018. There are many claims by the so-called developers of this crappy app to lure people into believing that they are investing in the real deal. The scammers claim that the software is a solution to the volatility which permeates the world of cryptocurrencies evidenced in the price movement of Bitcoin and altcoins like Ethereum. According to them, traders can make money no matter the change of BTC price. Since the experts in cryptocurrencies are saying that BTC, ETH, LTC, and others are like one big bubble ready to burst open and plummet, Bit Bubble Tech is trading mainly on CFDs and indices which rely on the downward trends of Bitcoin. Therefore, traders are sure of making money with Bit Bubble Tech App even if the big players like BTC and others collapse. Unique foolishness indeed! Also, another interesting claim is that the software is the handwork of many financial experts, strategists, crypto gurus and programmers who came together to develop Bit Bubble Tech Software. As a result of their combined effort, they discovered record-breaking trading strategies, overlying algorithms and analysis tool which work together to make the software authentic and profitable. Well, it all sounds interesting except that there is no evidence to show that what they are saying is true. Also, I didn’t get any explanation anywhere about the algorithms. So before you fall for a line like “Bit Bubble Tech is a Multi-Algorithm computing App,” please try to know how the so-called algorithms work to be on the safe side at least. Another claim that will baffle you is the ITM rates which is an unbelievable high of 98%. If you are old hands in the crypto trading movement, you must have come across some legitimate trading apps. Now let me ask you, have you ever seen an ITM rate of 98% on any of these apps? You and I know that this claim is utter rubbish. If they are telling the truth, then, people should be making thousands of dollars in profit and not mere $700. So you see, I don’t even think the fraudsters know anything about crypto trading in the first place. Your first inclination when you hear about a 98% ITM rate should be to run away from Bit Bubble Tech scam. 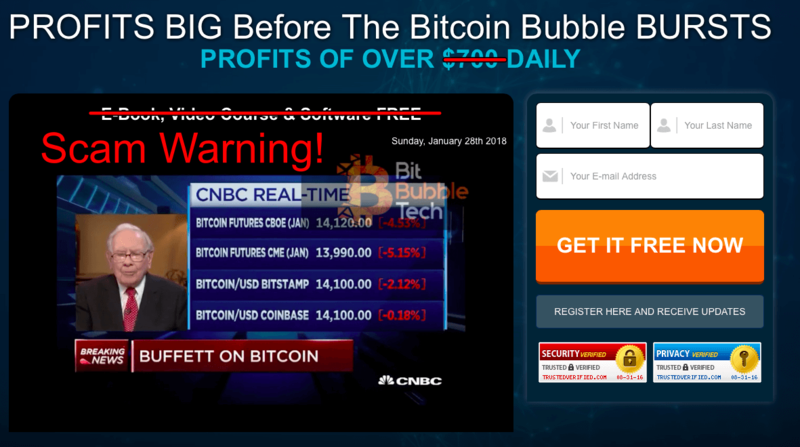 Who cares about a bursting bubble when the scammers are spewing nonsense? Don’t forget that a bird at hand is worth two in the bush. Keep your $250 in your pocket where it belongs instead of feeding con artists. Let’s not forget the e-book and the five trading videos that are available for newbies to learn everything there is about crypto trading. I also heard that if you read the book and listen to the videos, you will turn professional immediately. The educational jargon is another strategy to impress your money out of your pocket. Do you have to pay $250 for the information you can get for free online? I don’t think so. If you want to learn about digital currencies and everything that relates to them, search the web and make Google your friend. Don’t waste your money and time on rubbish. If you don’t know what to do with that $250, donate it to charity. At least, you would have contributed to humanity instead of promoting a scam software like Bit Bubble Tech. Now, let’s talk about the rumors they are spreading about releasing a cryptocurrency in 90 days. I heard that members of the Bit Bubble Tech system would gain by getting huge discounts when the software launches the coins and do their ICO. Apart from the cut, members can also stake, trade and lend the new cryptocurrency. You see, this app is an impressive package I tell you but unfortunately, so many things gave it away for what it is, a big scam. Let’s examine some of the red flags of this system in our Bit Bubble review so that you will know why I am advising you to run. We are talking about money here, isn’t it? So, why all the secrecy and anonymity. Bit Bubble Tech software just came onboard the financial market in January 2018, but no one knows the brains behind it nor is there any mention of the company behind it. I have searched for the name of the company, contact information or even the owner and I got nothing. If you are cautious like me, you will know that this is a clear indication that something is fishy here. These scammers should stop insulting our intelligence. How can I trust a trading robot with no history nor backing to make money for me? My conclusion, Run! Since the Bit Bubble Tech App is providing an investment service where you will deposit, and it will make money for you, this app should be operating with a license. Unfortunately, instead of showing us their license, they filled the website with stickers and trust seals that don’t exist. You see why I said that these con artists should stop insulting us. Even though Bit Bubble tech just came out recently, there is nothing new about the trading software. Oh! It now has a new name. 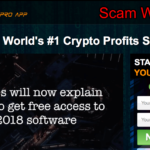 Having written many reviews about scam crypto trading apps, I was able to recognize this software as being popular among scam artists. 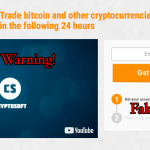 Check out reviews of similar scams which we recently exposed like Bitcoin Code, Ethereum Code (Don’t forget to check user’s experience in the comments section); you will notice that they are all using this same app where many traders lost huge amounts of money. One of the antics on the software is that once you register, you will connect to a broker in whose account you will deposit your initial investment of $250. 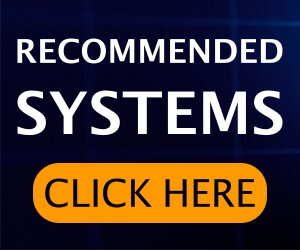 According to the fraudsters, you can decide to change the broker anytime you want on the system. It all sounds good but mind you, these brokers are operating illegally and has no form of regulation governing them. If you register and deposit on the Bit Bubble Tech software, you have succeeded in enriching a fraudulent broker. 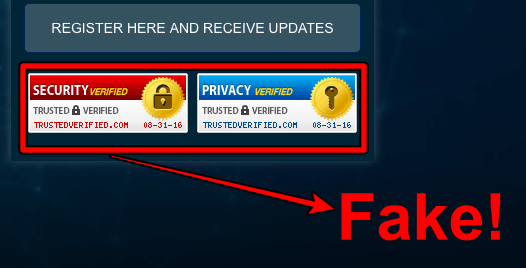 Take a little trip down the footer of this 2018 latest scam of a software. Notice the disclaimer that stated “Option Trading” and tells me why a crypto trading app will say such a thing. Hey! We are talking about trading in cryptocurrencies and not Option Trading. Let me tell two scenarios of what I think. The first is that the idiots copied the disclaimer from somewhere and didn’t take time to edit it before pasting it on their website. Secondly, they might be into Option Trading instead of Crypto Trading like they want you to believe. Bit Bubble Tech Review Verdict – Bit Bubble Tech is confirmed scam! Avoid it! Don’t waste your time on Bit Bubble Tech scam trading app. There is no reason for trusting their claims and promises. You will only enrich an unregulated broker who is in league with the promoters of this crappy trading app. The level of transparency is zero, and there is no license of operation anywhere to at least protect your details and interest. So, don’t invest in Bit Bubble Tech because you will waste your time and money. Don’t forget to share this Bit Bubble Tech review with your friends/family members, so that they can stay safe from all these scams too.